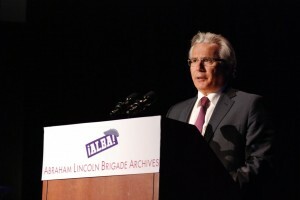 In the first piece of positive judicial news for Judge Baltasar Garzón in a long time, the Supreme Court has announced the recusal of five of the seven Supreme Court justices initially assigned to the tribunal in charge of judging Garzón for alleged abuse of power when opening an investigation into crimes committed by the Franco regime. The recusal, El País reports, was requested by Garzón’s defense team because the five justices have been involved in earlier stages of the case, which “contaminates” their impartiality. In the Spanish system, members of the Supreme Court are assigned different roles for each case brought to the court. Thus, each of the three cases pending against Garzón has been assigned to be instructed by one Supreme Court Justice, who is in charge of the whole investigative process. Once the investigation is complete, the accused is judged by a tribunal of justices who have not been involved in the case at any of its earlier stages. The victims’ organizations who brought the case of the Francoist crimes to the Audiencia Nacional (National Criminal Court) to begin with, have reacted positively to the recusal decision. “There now is a better chance that Garzón may return to take the case back up,” they declared. Coverage in English here.